Plot; Bolt is out deep in Darkwood Forest, by himself (or so he believes) practicing his skills with fire. Is there someone watching his little show? Who is king? ; Bolt is king, which is me. I am king. Bolt padded back and forth, muscles flexing beneath his crimson pelt, constantly tensing and relaxing. His breathing came out in deep, controlled breaths, a white hot feeling spreading across his entire body as he focused his full attention on the flames that flickered and danced in front of him, bright orange and faint red mixing together, growing and shrinking and nearing and backing away with every move he made. He had been doing this for a few minutes, working up the flames as if they were a large buck you had to tire before taking down. This was important for him to do because he was about to attempt to do more dangerous tricks with the flames, which while he couldn't get hurt by them, he could easily set his surroundings ablaze. With a deep breath and a could movement he turned away from the flame and the flame followed, making an arch, and he proceeded to throw his head up into the air, beginning a dazzling dance with the flames, jumping and turning and snapping with energetic bursts of movements, the flames matching his movements. Lily lurked in the shadows, attempting to blend into the colorless shadow. However, her snowy pelt stuck out as bright as day. If anything she was making the shadows brighter. Realizing that this was an impossible thing to accomplish, she gave up and straightened herself to full height. She yawned out of pure boredom, procrastination seemed to be the only thing that was encouraging her to explore these lovely new lands. That, and curiosity. 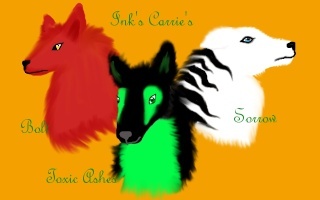 The two combined created a troublemaker and with a wolf so willing to follow it, well there was only a matter of time before chaos broke out. The smell of smoke drifted beneath her nose. She blinked, clearly confused. Smoke was only created by one thing, fire. Lily scrunched up her nose at the awful smell, frowning in disappointment. A fire in the middle of a forest could not be good. Her eyes drifted from side to side, searching for anyone within sight. When no one was to be found, she came to the conclusion that she would go check it out. 'Now, where are you?' she tilted her nose in the air, following the thick smell of smoke. Her paws glided over the forest floor, moving at a rather quick speed. The last thing she needed was her potential new home to burn beneath her paws. Luckily for her, she didn't seem to be too far from the location of the fire, as the smell increased. Lowering her body cautiously, she remained hidden, just in case another wolf had made it here before her. Quietly, she inched forward peering from beneath a bush. What she saw in front of her left her mouth hanging open. A wolf stood in front of the flames and he was...was...controlling it. Lily couldn't believe her eyes. There was another...like her...with powers. "Aren't you afraid of burning the forest down?" she asked, once again allowing her curiosity to take over. Stepping out from behind the bush, she walked closer, her eyes on the wolf rather then the flame. Not once had the thought occurred to her that this wolf may be potentially dangerous. No, the only thing she could think about was the fact that there was another, just like her. Bolt felt his heart pound against his ribcage, like a bird in a cage. Every part of him felt alive, like he was soaring and nothing bad could ever reach him. He loved it. As he continued twirling and jumping, making the flames arch and spark, he avoided trees he neared with little effort. Not a lot of wolves knew it, even those in his pack, but Bolt was, or could be, if his nature ever turned darker, a very dangerous wolf. Having practiced his control over his power, he was very skilled at controlling flames, and could easily overpower another fire-controller with less skill. He was so caught up in the thrill and excitement of controlling the flames that he didn't notice a wolf nearing, until their voice rang out and he jumped in surprise, bristling slightly as the flames vanished, and he spun, the thrill disappearing almost instantly. He saw a white pelted she-wolf coming closer, unfamiliar to him, and his ears flattened slightly. A stranger this far into the territory? He thought, ears perked forward and muscles slightly tensed, ready for whatever was to be thrown his way. It took him a few moments before he remembered the wolf had asked him a question, and as his crimson fur started to settled back down on his body, as there was no serious threat, he replied. "No, I don't. I have complete control over the flames." He responded in a formal matter, glancing over the wolf before asking a question of his own. He asked, completely forgetting his manners and and becoming rather blunt after having had a dance with the flame, which left him a bit more wild each time. Notes: Yeah, finally got this finished. She rose an eyebrow, naturally curious about a creature such as he being able to control such a wild element. Maybe that was why she didn't fear him, if he was going to hurt her he would've already. Although, to her, it seemed highly unlikely that the male was capable of controlling the flame completely. It didn't look like something that could be controlled and mastered. Yet, what did she know? Moments ago she had thought she was the only one with powers such as this. Clearly, this male sparked an interest and it glowed in her eyes. "Always?" she asked walking around him an observing his unique pelt coloring. The heat radiating from his body brushed against her pelt. This was completely new to her, never in her lifetime had she met a wolf that had control over another element. Only once had she met a wolf with an unusual power and that was long ago. Lily stopped in front of the male, shrugging carelessly at the ask of who she was. "Just an explorer in search of an old friend. "she said calmly as if those words alone held the answer to everything. It was an honest answer, the only one she was willing to give. Her azure gaze flickered over him. Countless questions rising to mind, she didn't know where to begin therefore she randomly chose one. "What else are you capable of?" sitting down, she wrapped her tail around her paws. It was apparent that she did not see him a threat, nor he her. Though, how he would respond to her lack of introduction was a different story. Bolt shifted on his paws at the question, seaming so simple. "Well, not always. It is really hard to control when I lose my temper." He replied, not really knowing why he was giving answers to this wolf, yet he didn't really mind it. His eyes narrowed at the reply to his question. He hoped this wasn't another wolf that dodged questions and made comments that absolutely infuriated. If the wolf was like that, he might just end up burning them to ash, seeing as no one was really there. Bolt sat down when the female sat down, yellow gaze focused straight on the stranger. "As you saw, I am capable of controlling fire, along with creating it out of the air, yet only if it is not raining. I can also light a wolf or creature I don't like on fire, and might I say, they burn down to ash incredibly fast." He answered, ears flicking in slight annoyance. There were things he could do that he didn't know yet, as new abilities kept appearing over times. Bolt started to speak again. "My name is Bolt. I am the Alpha male of the lands you are currently in, by the way, which are the lands of the Heroes and Legends pack." He introduced himself and paused for a moment, thinking, before he started speaking again, adding another bit of information the female might be interested in. 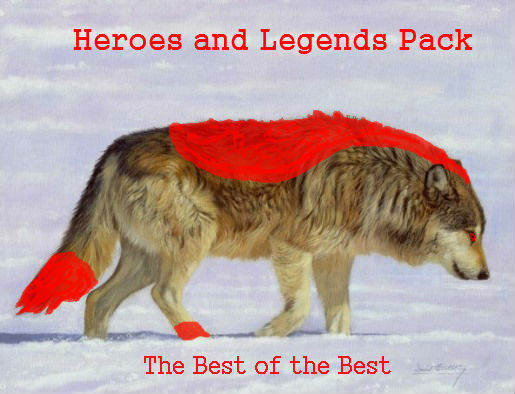 "A pack full of wolves with all kinds of powers." He added, the faintest smile curling his lips. Lily nodded in understanding, she too had a temper and when out of control caused many problems. Most of the time she dealt with it without her abilities, but of course there were those few incidents. Rain? That was what dulled his abilities? Of course, fire and water would collide. She wondered why, out of everyone would he be sharing this information to her. Obviously, he didn't see her as a threat, for most didn't. She didn't prove to be one, not for now anyway. Being much to busy with her curiosity and thirst for knowledge. She furrowed her eyebrows, a question coming to mind. "Naturally it wouldn't work underwater either, correct?" she tilted her head slightly at him. Those questions may be simple, but to her they provided new information she didn't know the world was capable of giving. Lily lowered her head slightly, as a greeting. She may not be willing to share her name but it that didn't mean she had forgotten her manners. Alpha male. If she was correct and this pack was like every other, which in many ways it wasn't. That would ideally make him mates of the wolf she was searching for. Lily kept this information to herself. What was the point of a surprise if everyone knew she was coming? Lily blinked, clearly taken back. She had had her suspicions but never had she thought it was possible, not in a million moons. Her eyes drifted to the forest behind the male, this place was a safe haven, for wolves just like her. Finally, there was a place where she could express and be herself without looking over her shoulder. Naturally, for her this was not enough evidence. She was still skeptic, without more knowledge or proof, she always was. "Powers...Like what..for example?" her eye drifted back to him. The thought occurred to her how incredibly dangerous is would be to have control of a pack such as this, especially if others held the capability to over throw their leaders. Bolt's ears flicked, the wind blowing past it, as the female asked another question about his powers. Ever so curious, isn't she? He thought in amusement, barely keeping the grin off his face, features calm as the forest around him seemed to get restless, the wind picking up and rustling the leaves and branches of the trees as it passed. He paid it no mind as he responded, rather dryly, as it was quite an obvious thing. He confirmed with a nod of his head, muscles rippling along his back as the wind brushed through his crimson pelt. Bolt didn't speak or respond when she nodded in response to his introduction, tail twitching as a leaf blew over it, brushing past it on its way by. He let a grin finally stretch out across his features as he saw the reaction the female had to his statement about his pack having powers, and he listened to the question asked, quite happy to answer it. The young Alpha was always happy to show off his pack's power, even though in most of the world wolves like the ones in his pack were shunned. The creatures that shunned them were just afraid, because what they didn't know sparked fear. "Well, my mate can read minds, which is a rather helpful skill to see if anybody is planning something rather bad, like a take over." He listed, tilting his head as he thought of the pack and all the members and there unique powers. "The lead Guardian has power over ice, much like I have power over fire. And there is a wolf with Thermal vision, who is Lead Hunter." He finished, only listing off a few from the top of his head, shifting on his paws as a question of his own entered his mind. "You have never seen wolves with powers? You seem a bit surprised, which isn't out of the ordinary." Bolt asked curiously, thoughts moving in and out of his mind. His features softened as one particular thought ran through his head, his amused grin turning into a more fond one as he thought of all the canines in his pack. "This pack is a place for the misfits, the ones who really don't fit in anywhere else. It's basically us against the world." He added softly, waiting for a response. The smell of smoke clung in the air, she could smell it from a mile away. How he was used to such a smell was a mystery to her. The awful smell corrupted the fresh air and clouded the sky, maybe this was why she disliked it so much. Surprisingly enough, fire didnt bother her too much. 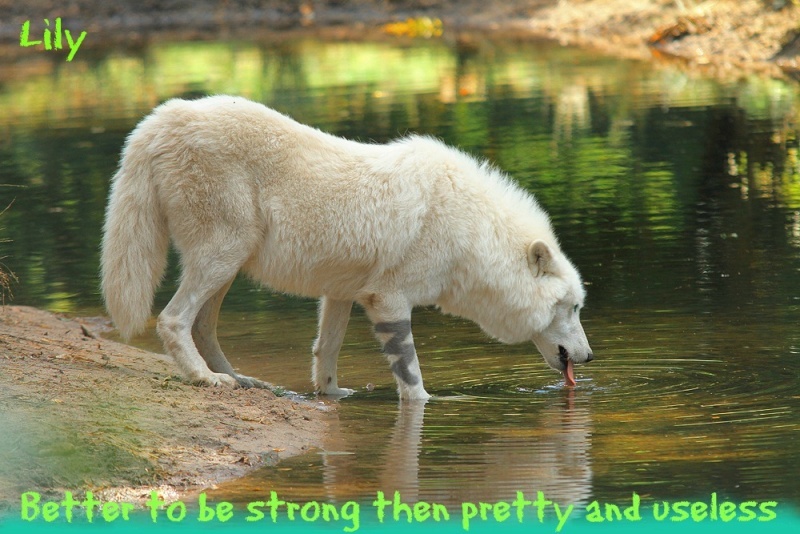 Lily's assumption had been correct, the wolf she was in search of was the male's mate. The thought of the female almost brought a smile to her face...almost. Bolt seemed to hold so much confidence in his mates power, yet she had seen it at work. From what she understood, like everything else, there were ways around it. If you weren't thinking about what you were about to do the power would be of no use. Which was obviously a down side, but most have little, if any over their natural thoughts, hiding something so huge would be rather difficult. Announcing to him that she knew his mate, seemed rather...well she didn't think he would exactly react in a friendly manner. The decision was made, once again, to leave the male without that kind of information. The less he knew, the better. For the both of them. Lily listened to the powers carefully, taking a mental note of each of them. Again, she didn't understand why the alpha would be sharing this type of information to a complete stranger. But that was his fault, if he wanted to give all the secrets of the pack away to a potential threat, then so be it. Then again she had thought about the fact that he probably thought of her as a normal wolf, one that would be pretty easy to BBQ. She shook her head, "That is not what I'm surprised about. Iv seen wolves capable of incredible things. I just didn't realize there were so many so close together, living as a family. That was what surprised me." she replied truthfully. Never had she heard such of such a thing. Don't get her wrong, it was great but it would definitely take some getting used to. The way Bolt mentioned the pack bs the world sounded sad and rather lonely. It was a world that she didn't want to be apart of, she wanted it to be different, different to where everyone was treated equally. Then again, you don't always get what you want. "Sounds like an uneven fight." she admitted. Lily's gaze drifted to the fallen leaves rustling on the ground, being pushed by the wind. Her ears twitched at the whispering of the tree's. The cold air felt good against her pelt, the warmer temperatures was definitely something she was not yet accustomed to. Bolt shifted his paws, feeling a bit restless, as he listened to the female speak, answering his question. He nodded, finding his gaze wandering, scanning the forest, feeling watched by a force not yet seen. It happened from time to time, though most of those times, it really was nothing more then just a feeling. His ears perked forward and he directed his yellow gaze to the she-wolf, listening to her comment about how uneven a fight it was. His grin turned into a sad smile, soft and flickering, like a flame that was being put out. He confirmed, sighing so softly that it could have gone unheard if nobody was paying attention. The sad smile turned into one of amusement, although a bit bitter. "Though, we have an advantage." The crimson pelted Alpha commented, meaning the powers, and came to a stand, stretching before standing straight, ears perked forward and a curious look taking over his features. "You can join, if that is what you would like. Everyone is rather friendly. Though, if not, that's fine. I got to do a sweep of the territory, would you like to keep me company?" Bolt asked, head tilted. He didn't find the she-wolf's presence to be a bother, and she seemed extremely curious about the pack, yet even if she still was annoying and was unbearable company, he couldn't very well let a stranger loose in the territory, could he? Lily shook her head at the male's comment, the smallest of smiles crawling onto her muzzle. She couldn't help herself. The comment was so true, even if they were outnumbed, they were stronger. Always would be. She turned her head away so that the male couldn't see her smile. Her strong and mysterious compose was crumbling. Although it faded just as fast as it had arrived, she made sure not to let is slip once again. She tilted her head to the side at Bolt's offer. Slightly surprised that he would mention it, as far as he knew she didn't have powers. So why would she be invited to be apart of a pack where everyone did? "I'll think about it." she said as she stood up. Placing her forepaws forward she stretched, pulling her muscles before standing back to full height? Walking past the male, she flicked her tail. Exploring was what she did best and getting led around with the alpha, well she couldn't ask for a better tour guide. Lily turned back to where the red pelted wolf was standing, "Well, what are we waiting for?" She paused, allowing him the chance to speak before continuing. "Shall we?" she motioned her head to the trees, eager to receive the grand tour. Notes: Sucky and short sorry! Bolt raised a curious eyebrow when the she-wolf turned away for a moment, and he tilted his head, smile twitching at his lips, slightly amused. He merely nodded in response, happy that the female at least was going to considerate, or at least she said she was. Most wolves in the pack had powers, yes, but upon accepting them a lot of the times he hadn't known what power they possessed. He watched as the female stood, stretched and walked past him. The young Alpha grinned, beginning to pad forward. He stated, amused, and paused ears flicking as the female spoke again. The red furred male nodded silently and was off, easily keeping up a fast pace, muscles flexing beneath his pelt with every long stride he took. His eyes scanned the area, and he didn't turn back to look to see if the female was following him. He usually moved fast, and a guest wasn't going to make him change that anytime soon. He was really not passing anything to grand, just wandering through the trees, keeping a careful eye out for anything dangerous. He finally stopped when he spotted a small river, really nothing quite noticeable, and padded slowly over to it, lapping at its water before turning and sitting, eyes looking around for the female. Fish started swimming up towards him, his red pelt like a lure, but he ignored them, for the time being. Notes: This post is garbage but enjoy! Word Count:- To lazy to add. Lily followed the red male quietly, without a word. She felt no need to speak as there was nothing that needed to be said. Weaving in out of the thick and unfamiliar tree's. She couldn't help but to look around at the new and undiscovered territory. To her, the location didn't look half bad, but of course she had only wandered around bits and pieces. For all she knew the best was yet to come. The sound of rushing water was like a drum to her ears. She heard it long before the small stream came to view. Lily's eyes wandered on the clear flowing water for a tad to long. 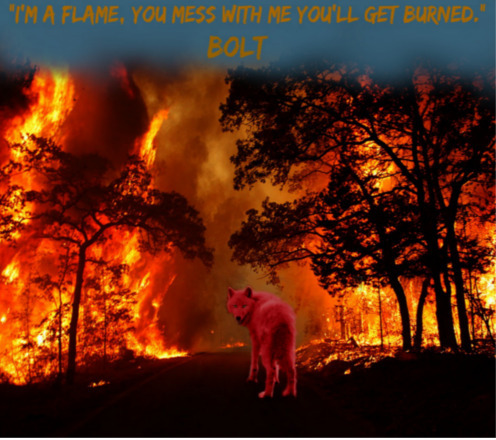 As bolt stopped, so did she, rather abruptly to not run into the male graced with the power of fire. She was certainly surprised that a wolf that controlled fire would travel so close to the icy substance. 'Its not something he could avoid' she thought silently, reminding herself that water was essential in life. Her paws carried her forward as if aiding to the water's call to her. For a long time she had ignored the pull she had felt and the need to use her powers, heck she couldn't remember the last time she had used them. Or better enough, considered using them. This time was different, she welcomed her powers willingly. Lily slid past Bolt as she too moved to the water line, sitting down next to the rocks being sprayed by the lingering water. "So, Kimbra, how is she?" she asked casually. It was an innocent enough question. There was one problem, however. Bolt hadn't given her the name of his mate. She had just given him a clue to the puzzle, whether he was smart enough to put the piece together was up to him. Voluntarily, her paw made its way to the water. The cold liquid pushed it's way past her continuing down stream. Her pawl swirled in circles slowly, feeling the water push through her fur. Not yet had she revealed her power but she was certainly close to doing so. "You want a fish?" she asked, her eyes searching the clear water for the golden scales. Notes: Don't worry about it. Bolt bristled slightly at the mention of his mate from the stranger's lips, turning his yellow gaze to the female, eyes narrowed slightly. He said, voice low, almost like a growl. He just stared at the female when she asked if he wanted a fish, and he huffed, annoyed. He could get a fish anytime, it was, surprisingly, almost ironically, the only type of hunting that he succeeded at, despite it being water related. He ground out, thinking. How did this female know of his mate? He hadn't said anything about her, and he felt especially protective at the moment, considering the pups that were soon to be born. She turned her gaze towards him at the roughness of his tone. Taking all of her paws out of the water, she sat back. Her tail fluffed curling around her, she flicked her ear. 'Why so hostile?' she thought silently, somewhat amused by the male's reaction. Although she didn't show it, she hadn't expected anything less. Being protective over the wolf he cared most about was a given, especially when a stranger butted in. Unfortunately, she wasn't willing to answer his questions until her's was answered. Not that it was any of his business, really. One of her forepaw's swirled thought the water. "You never answered my question..." she pressed. It would only be a matter of time before her patiences grew thin, all she required was a simple answer, what was so complicated about that? At the moment, she held all the power and she was very aware of that. Being so close to the source of her power only seemed to increase her confidence. One bad move or refusal to answer her question and she might just have to cool off this hothead. Notes: Don't worry about it mine is just as bad. Bolt huffed, highly agitated, when the female pressed for an answer. His yellow eyes narrowed, lips curling back in an almost snarl like expression, though he guessed the question was innocent enough. If this wolf pulled anything, he could easily turn it to ash within seconds, almost as fast as a blink of an eye. "She's fine. She's pregnant with pups currently." He stared straight at the female, ears perked forward. He stood up, switching his gaze to the river, watching his reflection ripple in the water; unnatural red colored pelt and piercing yellow eyes, it was almost like a flame that had took the form of a wolf, still wild and untamable. With a quick, practiced, his paw dipped into the water and circled around a fish that had been lured towards him and flicked it into the air. He caught it in his jaws firmly, crushing it's neck swiftly and dropping it between his paws. He did all this without the usual joy and excitement he felt, unpleasant thoughts running through his mind. The red pelted male asked, tone calmer then his before annoyed one, yet this calm was much more like the calm before a storm, eerie. He kept his gaze to the water, inspecting his reflection in the water once more. The sound of a disrupted in the water pulled her eyes towards the male touched by fire. He had managed to catch a fish and was killing it just as quickly. "Who are you?" he asked after his meal was finished. Lily watched him, her eyes following his gaze towards his reflection. She remained silent, watching the flow of the water. So many thoughts were running through her head she couldn't sort out right from wrong, she was making assumptions and preparing for the worse. Ready to take her leave and travel to new lands where she would be welcomed and accepted for who she was would be difficult, yes, but not impossible. She turned her head to look at her own reflection, unmoving and still as the water flowed slowly. Her eyes darkened and without touching the water ripples were sent outward, messing up the face she saw looking back at her and disrupting the reflection of the male. This...this...gift, as they called it was what was causing her so much trouble in her life. It was what had ruined her life back home and it continued to plague her like a sickness, following her wherever she went. She hated it, she truly did. If she could rid her life from it, she would do it in a heartbeat. "An old friend of your mate's" she said quietly as a mumble that was crushed and swallowed by the sound of the water against rock. Lily drew her gaze from the liquid, her eyes lightning to their original color. "My arrival was supposed to be a surprise but with the pups arriving my time here will be short lived." she admitted.